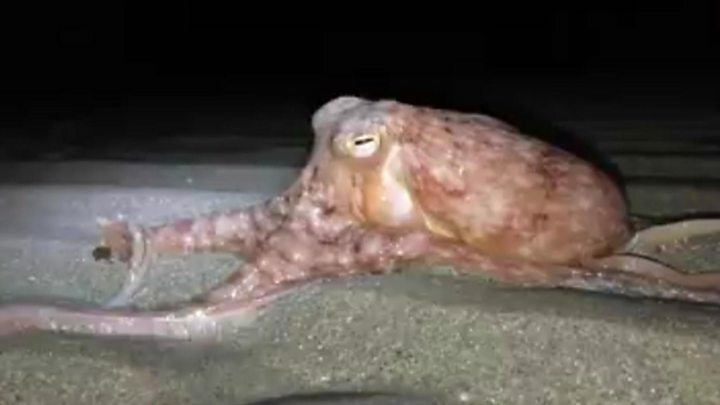 A group of octopuses were seen walking along a Ceredigion beach on Friday night, surprising experienced sea-goers. Brett Stones, who runs dolphin tours in Cardigan Bay, saw as many as 25 curled octopuses on New Quay beach as he returned from a day at sea. "It was a bit like an end of days scenario," he said. "There were probably about 20 or 25 on the beach. I have never seen them out of the water like that." Numbers of curled octopuses, which measure about 20in (0.5m) in length, have increased off the coast of Wales a due to the decline in cod populations. They are also a common prey for dolphins. But it is very unusual for any to end up on land. Mr Stones, 39, who has spent most of his life at sea and runs tours for SeaMôr dolphin watching, said: "Maybe they are getting confused by the bright lights in New Quay harbour and maybe they are dying off after summer or getting knackered after the recent storms. "We have got lobster pots and sometimes octopus will strip the bait, but they are very sneaky. "It is really rare to see them." Mr Stones said he helped collect those that were completely out of the water and returned them to the sea. Unfortunately, despite their best efforts, a number of the octopuses were found washed up on the beach on Saturday morning.